This week's Blitz of the Week is a stunt I have seen used effectively in the 3-3 (or 3-5) defense. This stunt is primarily a run game call used vs. 21 personnel formations. 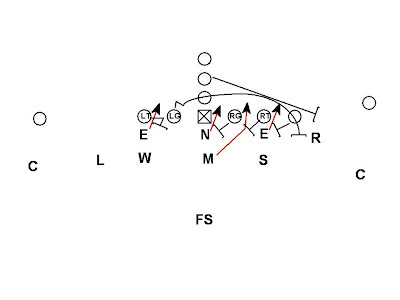 The stunt is designed to overload the TE side and limit runs to the 3 man surface. The whole line is slanting to the TE with the Mike blitzing into the TE side B gap. This is only a 4 man rush so the defense can still play Cover 3 (4 under/3 Deep), Quarters, or Robber. 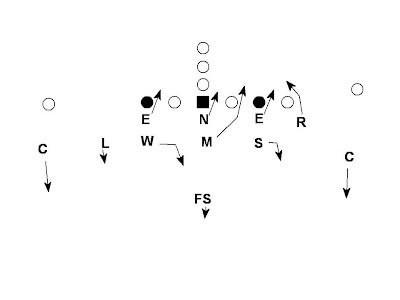 The coverage could also be a fire zone or man free if the defense wanted to bring the overhang player to the TE also. The effectiveness of this pressure is the ability to get defense players to the point of attack. Against power to the TE the slant of the DL and the blitz of the Mike helps eliminate the double teams by the offense. The Center has a decision to make. Either give help on the Nose or block back on the back side A gap. If the Center gets too involved with the Nose into the front side A gap there is a seam to press for the Will LB. If the Center blocks back the Nose has a better chance of getting penetration and controlling the play side A gap vs. a single block by the guard. The RT has a DL head up on him but if he spends any time on the DE the Mike should have a clean run through. This creates a single block for the play side DE. 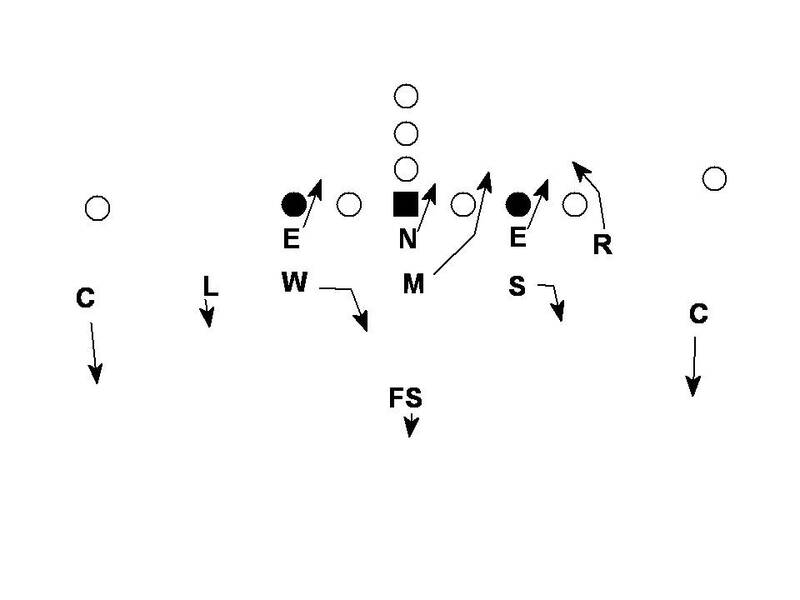 The LT vs. DE is a difficult cutoff block against a head up slanting DL. Most 3-3 teams use fast DL making this block even more difficult. If the back side slanting DE is creating havoc it is even more incentive for the center to block back and eliminate the double team on the Nose. Eliminating double teams allows the defense to stay gap sound. 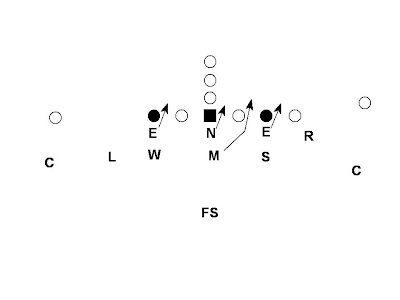 The second effect is that the puller from the backside that is rolling for the Sam linebacker has no place to roll and must take his path wide. Many offensive linemen struggle to pull and get width. Many offensive linemen can get out there but struggle to stay/get square once they are there and execute a block. Because the front side blockers are occupied the Sam and Rob are both able to play off the edge.